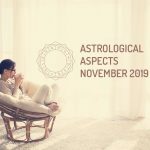 November 2019 is presented as a season of conciliation in emotional matters, motivated by the entry of the Sun in Sagittarius (22/11), the end of the retrogradation of Mercury in Scorpio (20/11), and the beginning of the direct phase of Neptune (27/11). What does this mean in terms of the astrological transits of November? The presence of the Sun in Sagittarius speaks of freedom and reformulation of beliefs. Remember that November 2019 is the last month of Jupiter in Sagittarius, which together with the force of the star king, raises personal development as an impossible need to avoid. On the other hand, the culmination of the apparent regression phase of Mercury retrograde, indicates the importance of communicating the deepest feelings, and cultivate confidence in the immediate environment. Finally, Neptune direct in Pisces will offer a better perspective of reality, already stripped of the nuances of illusion and escapism. Contact with one’s own emotional world is the main strength during this period of the year. Here are some of the planetary events that will affect the astrological transits of November 2019. Generosity, idealism, sincerity, enthusiasm, and independence. Ease in cutting off restrictive relationships. Respect for the freedom of others, and interest in sharing the most unexpected adventures. Take advantage of this transit of Venus, and break with routine. Mental agility. Objectivity. Balance. Ease in transmitting knowledge and information to third parties. Disdain for fanatical or sectarian attitudes. Emotional control. Tendency to hide feelings, for fear of being manipulated. Repressed instincts. Attachment to tradition and respect for authority. Professional recognition. Surrender to the work that is done. Precaution against the temptation to start a relationship out of interest. Organization and control. Need to establish practical and operational plans, objectives and structures. Ceres in Capricorn insists on taking control of all aspects of life, particularly at home and at work, under the firm belief that he knows what is “best” for everyone. Compulsive behaviors are frequent with this stellar position. Sensuality. Ambition. Intransigence. Perseverance when it comes to fighting for the proposed objectives. Jealous and possessive attitude. Avoid games of revenge and power. Determination. Self-analysis. Intuition. Cunning. Greater compression in the relations of pair. Overcoming old obsessions. Ability to discover the truth. Beware of what you wish for. Spontaneity. Curiosity. Desire to learn and venture into the unknown. Interest in philosophical conversations. Development of a new scale of values and beliefs. Personal self-improvement as an investment. Respectability. Faithfulness. Caution. Taste for tradition. Difficulty in expressing one’s own feelings (feelings remain in reserve). The possibility of establishing a formal relationship is analyzed in detail, although the same does not happen with amorous adventures. Taking advantage of the New Moon in Sagittarius, we manifest our intentions in terms of personal growth (studies, overcoming old patterns and false beliefs); international procedures (travel, business, scholarships); defense of individual freedom; and connection with other cultures. Dissolution of the need for isolation. Appreciation of reality. Link with the inner divinity (spirituality). Involvement in charitable or humanitarian activities becomes an exercise in inner healing. Eclipse season: what energies will eclipses bring in 2019? Solar eclipse 2019: how will it influence your zodiac sign? Lunar eclipse 2019: how will it influence your zodiac sign? How do moon phases affect us? New moon: does it have an influence on us?